Last week I shared my concern that Christian mysticism, which I think is vital for a vibrant spiritual walk with God, is tempted into becoming diffuse, sentimental, spiritual uplift. To be clear, we need spiritual uplift. We need awe, wonder and joy. We need to be astonished by beauty. And yet, there is a hard, cruciform edge to following Jesus. Let me again quote Dorothy Day: We only love God as much as the person we love the least. So what I'm wondering about is the shape of a mystical experience that leads us into that sort of love. In my post last week I called this an apocalyptic mysticism, an experience with God that traffics less in spiritual uplift than assaulting the hardness of our heart. If such experiences happen, what would they look like? My inspiration here is the mystical experience that assaults Mrs. Turpin in Flannery O'Connor's short story "Revelation." You need to read the story to get the full effect, but the gist of it is this. Mrs. Turpin is a smug, prideful woman who looks down her nose at the "trash" of the world. As Mrs. Turpin is sitting in a doctor's office, being thankful for the fact that she's a good, decent, honest person, not at all like the lowlifes sitting in chairs around her, she is eyed with increasing hostility by a teenage girl named Mary Grace. Mrs. Turpin feels uncomfortable under the gaze of Mary Grace, but she becomes convinced that the girl has a message for her, a revelation from God. Mrs. Turpin gets her message when Mary Grace throws and hits her in the head with a book. It's a totally unprovoked act of violence, but Mrs. Turpin is convinced it's because Mary Grace has seen something in her soul that only God could see. As the nurse and doctor hold and try to sedate the struggling girl, Mrs. Turpin leans in to hear the word of God Mary Grace has for her, the revelation. Mary Grace looks straight at Mrs. Turpin and spits, "Go back to hell where you came from, you old wart hog." Now that's an apocalyptic moment! That's a revelation! Stunned, Mrs. Turpin returns to her farm with her husband. Later on, Mrs. Turpin is hosing down the pigs while the sun begins to set. She takes up an argument with God. Why did God want her to see herself as an old wart hog? Wasn't she, after all, one of the decent, hardworking folks? If so, then why did God send that message to her? She didn't deserve it! Mrs. Turpin rants and screams at God. But as the sun sets, Mrs. Turpin looks up and has a mystical vision. She sees a great highway leading up to heaven. And at the front of the line, the souls getting into heaven first, are all the trashy people. And far to the back, the people at the end of the line, getting in last, are Mrs. Turpin's people--the good, hardworking, decent folk, stunned and shocked to find themselves bringing up the rear. Mrs. Turpin's vision comes right out of the gospels. As Jesus said to the Mrs. Turpins of his own day: "Truly I tell you, the tax collectors and the prostitutes are entering the kingdom of God ahead of you!" (Matthew 21.31). The vision at the end of "Revelation" is what I'm aiming at when I describe an "apocalyptic mysticism." This is a mystical encounter with the upside-down kingdom of God. This is a mystical encounter that's less about inspiring uplift than about getting hit upside the head to find out you're a wart hog from hell. "Revelation" is, of course, fiction. 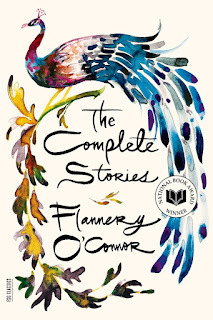 And it's Flannery O'Connor, so it's extreme, violent fiction. So I'm not suggesting that the experiences I'm talking about will go down as it goes down for Mrs. Turpin. I use the story "Revelation" simply to gesture, perhaps wildly, at what I mean by an apocalyptic mysticism. Apocalyptic mysticism is an experience that interrupts us with a vision of ourselves and the kingdom of God in ways we'd rather ignore or avoid. What I'm chasing is a mystical encounter that prompts conversion, repentance, and cruciform love.